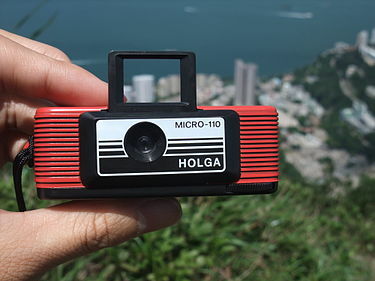 HF: There is a vast amount out there about Hong Kong made Holga cameras which have cult status. This information concerns the cameras and the photographs they take. There is however very little detail about where exactly they were made or ironically photographs of the factory, production, workers etc. Can you tell us more about the manufacturing of Holga Cameras in Hong Kong? And about the two companies involved? The camera’s name is supposed to have originated from the Cantonese ‘Ho Gwong’ meaning ‘Very Bright’ ‘Holga’ being an Anglicization of this. TM Lee designed the first Holga. Lee was involved in two companies, First, Universal Optical Industry, which began in the late 1960s (?) and made electronic capacitors for radios, then camera flash units and then cameras. Second, Universal Electronic Industries which started up in 1970. Lee designed the Holga camera in 1981. It first appeared in 1982 in Hong Kong. The Holga camera 120 was the very first medium format film camera with almost all its parts made of plastic. At the time, 120 roll film in black-and-white was the most widely available film in mainland China. The Holga was intended to provide an inexpensive mass-market camera for working-class Chinese in order to record family portraits and events. However, the rapid adoption of 35mm film, due to foreign made cameras and film imports, virtually eliminated the market in China for 120 roll film. As a result new markets for Holga were sought outside the mainland. By 2001, over a million Holgas had been sold worldwide. This article was first posted on 6th January 2014.